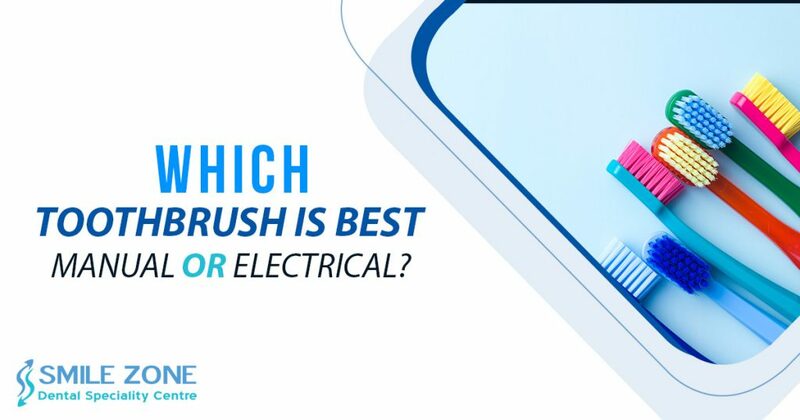 Which Toothbrush Is Best : Manual or Electrical? Oral care is essential to protect your overall health because poor oral health can cause many diseases. You must visit your dentist In Bangalore for a regular check-up because it is necessary to get treatment early for any oral problem. Visiting dental clinic In Bangalore does not mean that you have any serious condition it is useful to clear your doubts related to oral health. Your doctor will guide you about the precautions in order to keep an attractive smile. You should brush twice a day because it is useful to remove all the plaque and cavities from the teeth. Moreover, it is useful to protect your mouth from harmful bacteria and germs which cause cavities and decay. There are two types of brushes that you use to clean your tooth such as manual and electric. These both are effective and useful because they give more benefits to you and your mouth. Electric brushes are made with the electric motor because you do not need to putt extra force in order to rotate brush. This additionally includes on/off switch, which is useful to operate brush. This brush gives more cleaning as compared to manual and traditional brushes. There are many benefits of electric brushes are removing plaque, safe for gums, improve oral health, and fun for kids. A recent study demonstrates that an electric brush is useful to remove plaque because it works anti-clockwise. Additionally, it can reach the places where your manual brush cannot reach. And it gives you proper cleaning of every corner of mouth and teeth. Moreover, people who are disabled do not need to putt extra force since it is operated with the electric motor and button. This type of new toothbrush may cause less waste because you sometimes you throw whole the brush when you find it useless. But itis only happened in the case of manual brush, whereas for the electric brush you only have to change the head. It is additionally useful for kids because not every kid wants to brush early morning. It is useful for oral cleaning of your kid. Manual toothbrushes are too old but many people use them because they are still effective and less expensive as compared to an electric brush. A manual toothbrush is easy to use because everyone can use them with not much stress. You can simply buy these brushes from your grocery store or you should get these from the supermarket or medical store. These are accessible in every corner of the world. Whereas electric brush is not accessible easily, you have to order it online or you should wait for some time if you do not want to go online. This is the main and foremost reason why manual toothbrushes are still popular among people because these are less expensive as compared to electric ones. Electric brushes are too expensive whereas you can buy a manual in Rs.50 in India. Additionally, you do not need to take worry about the maintenance of this brush. If you find them useless, you can simply change them because these are too affordable.